DeadBeat and our old friend Mark Karan (The Other Ones,Bob Weir’s Rat Dog) will be laying down the grooves at The Bull Run in Shirley, MA and a portion of all proceeds will benefit The Oral Cancer Foundation! 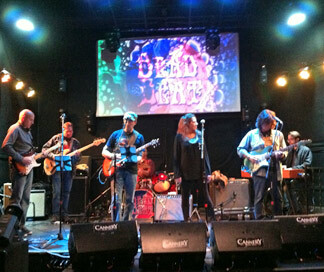 Deadbeat is a Grateful Dead Tribute Band in MetroWest Boston playing your favorites from The Dead & The Jerry Garcia Band, and a handful of others for the dead-head crowd! DeadBeat gigs are upbeat, fun, wild... perfect for dancers, twirlers & everyone looking to have a "real good time!" Deadbeat is: Mike (Bails) Bailey, Bass Guitar - Gary Barth, Rhythm Guitar; Vocals - Rich Cesarini, Keyboards - Jennifer Markard, Vocals - Joe Pulitano, Drums - Brian Stormwind, Lead Guitar, and Mark Karan, Guitar & vocals. $5 from every ticket will be donated directly to The Oral Cancer Foundation. Join us for an amazing night of music for a great cause! Come early for the great food and stay late for the show!